As “man’s best friend,” dogs have an innate loyalty that ties them to those they love for as long as they live. Sometimes that loyalty isn’t shared with humans and instead shared with each other. 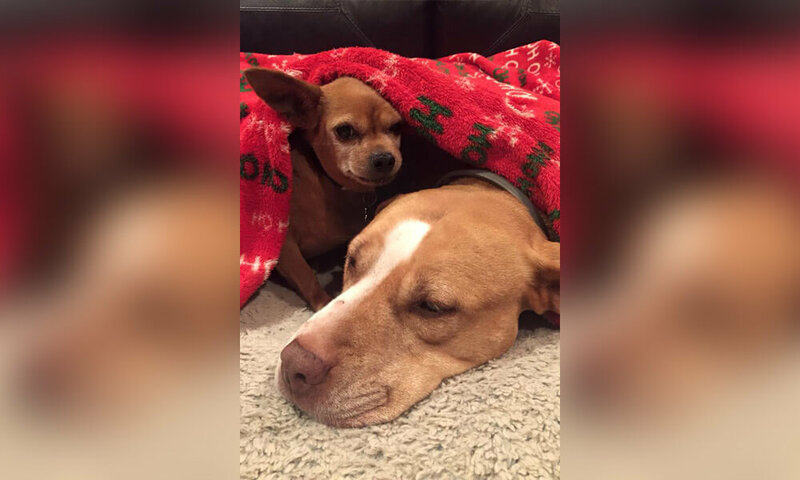 When this energetic pit bull and an ailing chihuahua were brought to the shelter, they went in with nothing but each other. 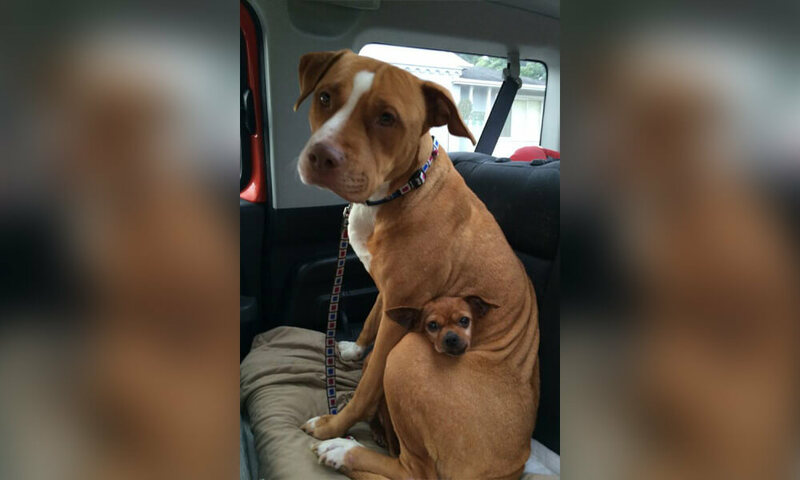 But when someone wanted to adopt the pit bull, her immediate reaction blew everyone away. 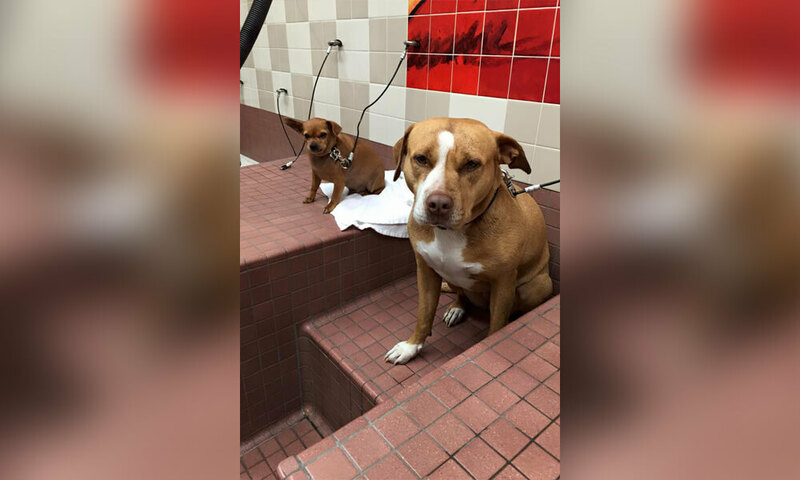 Merrill, a female pit bull mix, and Taco, a male chihuahua, were handed over to the Rocket Dog Rescue in October 2014. 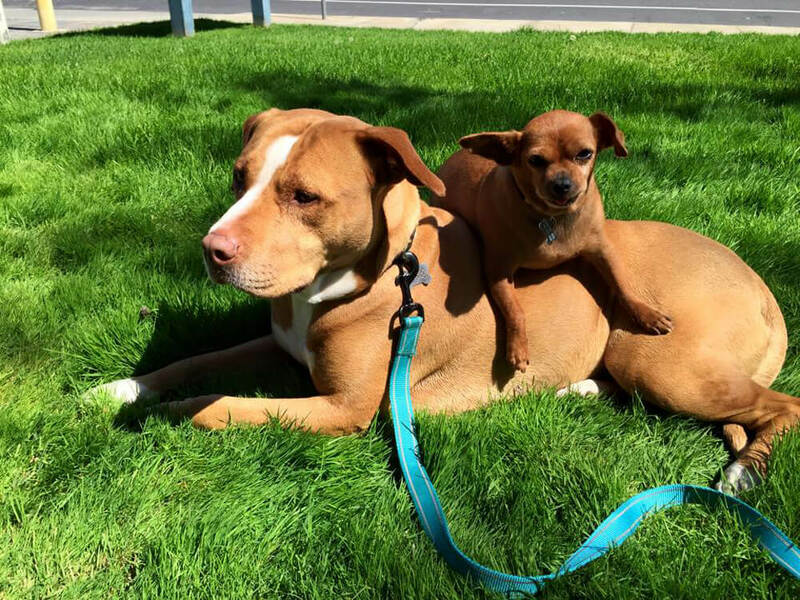 No one at the San Francisco-based rescue knew why Merrill and Taco’s owner gave them up, but they did notice something very particular about the unlikely pair. Merrill and Taco were inseparable. which led the shelter to want to adopt them out together. But adopting them out as a pair proved to be harder than expected. The volunteers and shelter employees at Rocket Dog Rescue knew nothing about Merrill and Taco’s life before they arrived. One thing was for certain, though. Merrill and Taco were practically attached at the hip. If they were separated for just a moment, the dogs would start wailing. 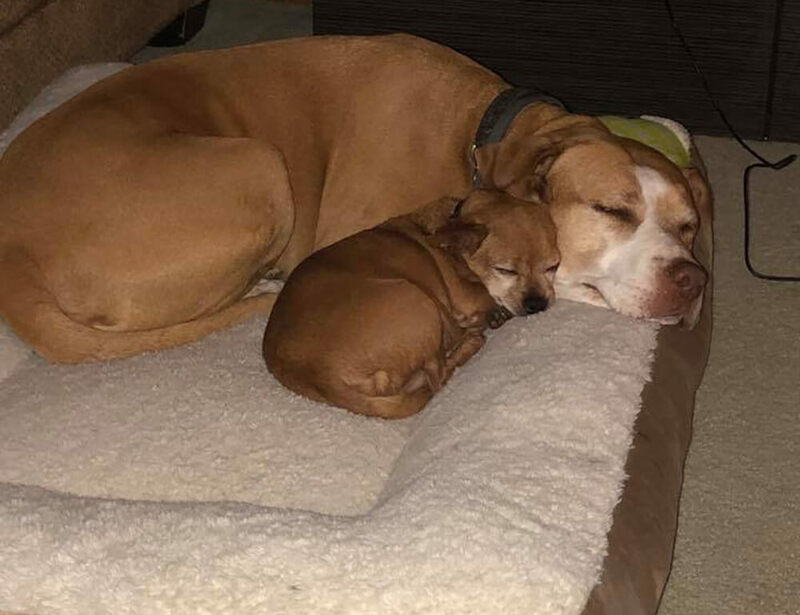 Sharing a photo of the dogs’ bond, the shelter wrote, "We just could not stand the thought of them being separated or waiting at the shelter for months to find a home TOGETHER." The veterinarians at Rocket Dog Rescue assessed Merrill and Taco upon arrival and found that they weren’t in the best of shape. In Merrill’s case, they estimated that she was about three years old and that she was probably being used for breeding. She also had a life-threatening urinary tract infection. This meant she couldn’t breed anymore, which is probably why her owners gave her up. Just as she was about to receive surgery, something strange happened. When Merrill was taken in for surgery, the rescue workers noticed that Taco, who the vets estimated was eight years old, became extremely anxious. Taco displayed signs of distress the whole time Merrill was in the operating room. The moment she was released and they saw each other, Merrill and Taco wouldn’t stop wailing for each other. The veterinarians wanted Merrill to recover on her own, but both dogs wouldn’t stop crying for each other. Finally, the rescue employees let Taco see Merrill inside the operating room. Taco immediately went to Merrill’s side for comfort and the dogs started to relax. 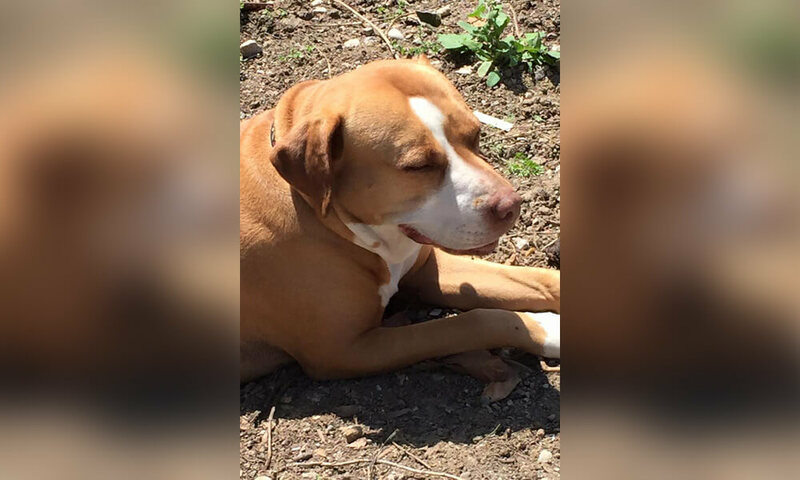 The rescue staff was surprised by the dogs’ unwavering loyalty towards each other. This made the rescuers realize something very important. Their eyes were opened to just how strong Merrill and Taco’s bond actually was. They then grew concerned that separating the dogs would cause more harm in the long run. Merrill and Taco’s strong bond was concerning for those who worked at the rescue. 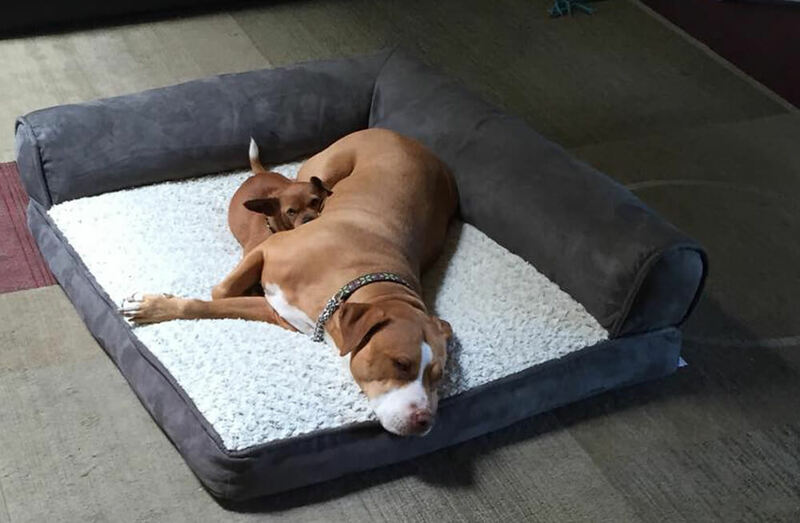 In their experience, they knew that people usually aren’t in a position to adopt two dogs at the same time. They had posted Merrill and Taco’s pictures separately, which generated some interest. Still, they knew that it was going to be tough if someone only wanted one dog and not the other. The true test came when someone took an interest in Merrill. Merrill was still relatively young and as a beautiful pit bull mix and so many people showed interest in adopting her. The same couldn’t be said for taco, who was already quite old in comparison. Eventually, the shelter found some potential new owners for Merrill. One man, in particular, fell in love with Merrill the moment he laid eyes on her. When he came to meet Merrill, he didn’t know what he was getting himself into. 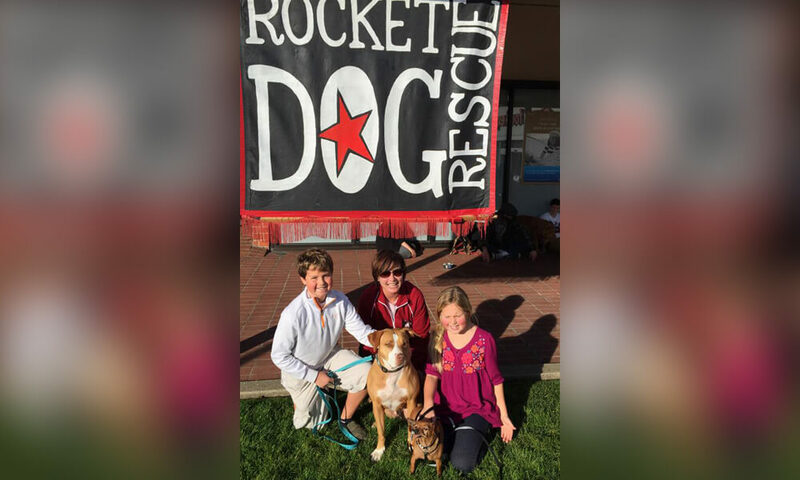 When the man arrived at Rocket Dog Rescue, he immediately signed the paperwork necessary to adopt Merrill. He couldn’t wait to take her home. When they arrived to the cage she shared with Taco, however, something very strange happened. Once the rescue workers took Merrill out of the cage, she and Taco immediately began crying for each other. The dogs’ desperate wailing left everyone in the room dumbfounded. The man who wanted Merrill was confused. Merrill’s unwavering loyalty to Taco was very apparent that day. Once it was clear that Merrill wasn’t going anywhere without Taco, the rescue staff had to explain the dogs’ situation to Merrill’s potential new owner. Thankfully, he completely understood. Sympathetic to their situation, he didn’t want to be the cause for such a traumatizing separation. The real question now was if this man would be willing to take both Merrill and Taco home. Though the man felt for Merrill and Taco’s situation, he was in no position to take in two dogs at once, so he ended up leaving with a different dog. While the rescue employees were happy to see that one of their dogs have found a forever home, they were still in distress over who would accept Merrill and Taco together. Finally, they thought of a brilliant way to show that Merrill and Taco were a package deal. Though they’d already listed Merrill and Taco on their site separately, Rocket Dog Rescue decided to take a different approach to get the dogs adopted together. They created a joint post that explained Merrill and Taco’s undeniable bond. To make things even more adorable, they posted a picture of Taco’s tiny head poking out from Merrill’s lap! "This dynamic duo has lost their family, their home, and now we can’t let them lost each other!" they wrote. 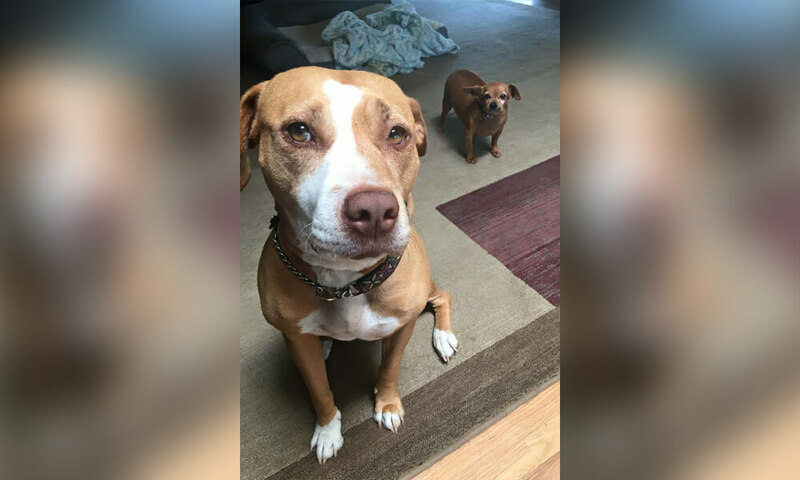 The new joint post went viral on the Internet, thanks to the adorable photo of Merrill and Taco. Soon, the post spread all over social media with many people expressing their interest in the pair. 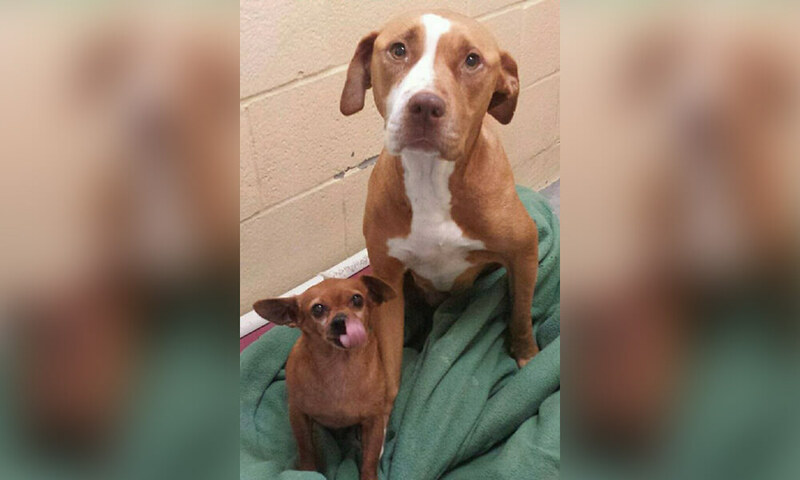 Merrill and Taco had momentary Internet fame, but was it enough to get them adopted together? While many people commented that they would like to adopt the dogs, it was hard to actually find someone who would seriously follow through. 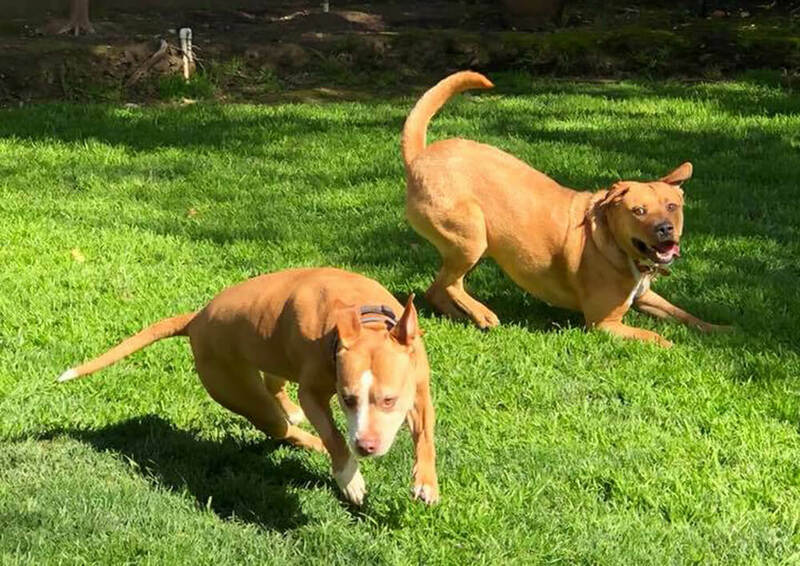 With 14,000 likes, 1,000 comments, and over 26,000 shares, it seemed that the Rocket Dog Rescue was finally getting Merrill and Taco the recognition they deserved. They knew that they had made the right decision in keeping Merrill and Taco together, instead of forcing them apart just to adopt them out. But of all the people who reacted to the post, was there really someone out there who’d be willing to take Merrill and Taco together? Despite Merrill and Taco’s newfound Internet celebrity, they still hadn’t found someone to actually adopt them into a forever home. Rocket Dog Rescue kept posting updates on the duo to let people know that they were still up for adoption. Everyone admired the strong bond that Merrill and Taco shared, especially considering their unconventional pairing. 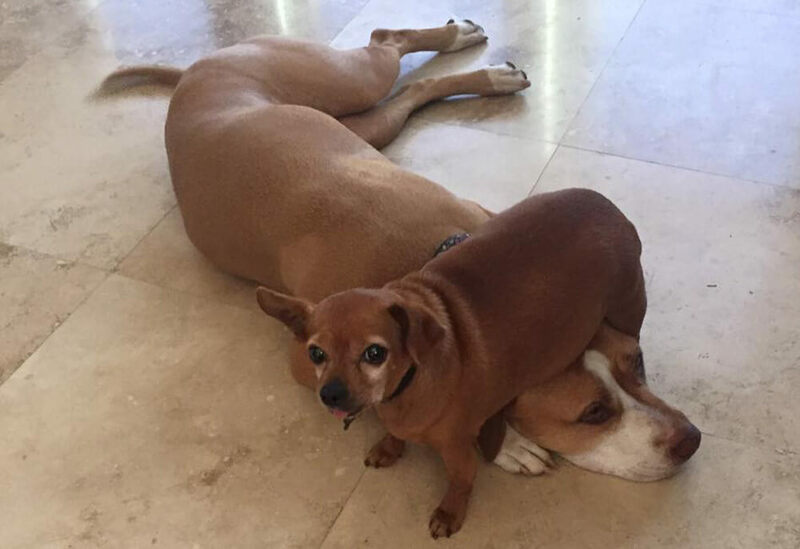 After all, Merrill was a huge, young dog, while Taco was small and old, yet they loved each other as equals. 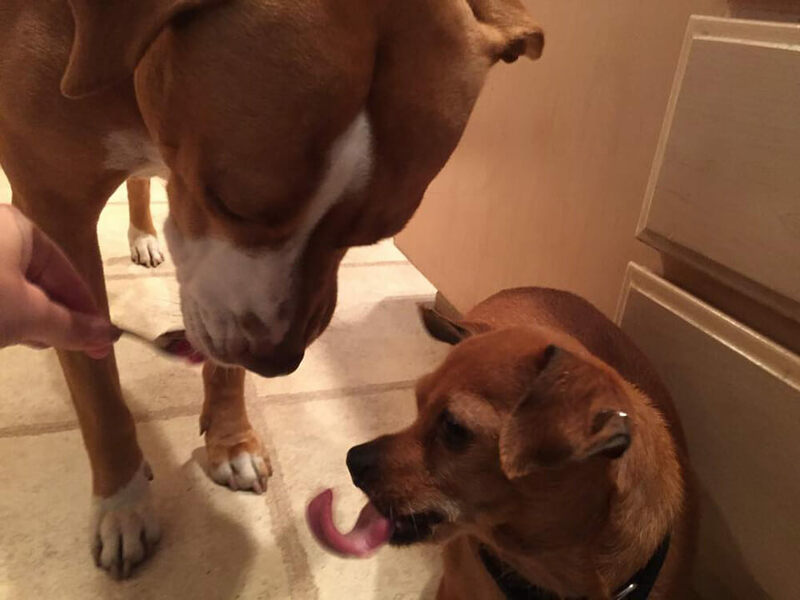 While Merrill and Taco waited for a new family, a volunteer named Jodi decided to foster them. 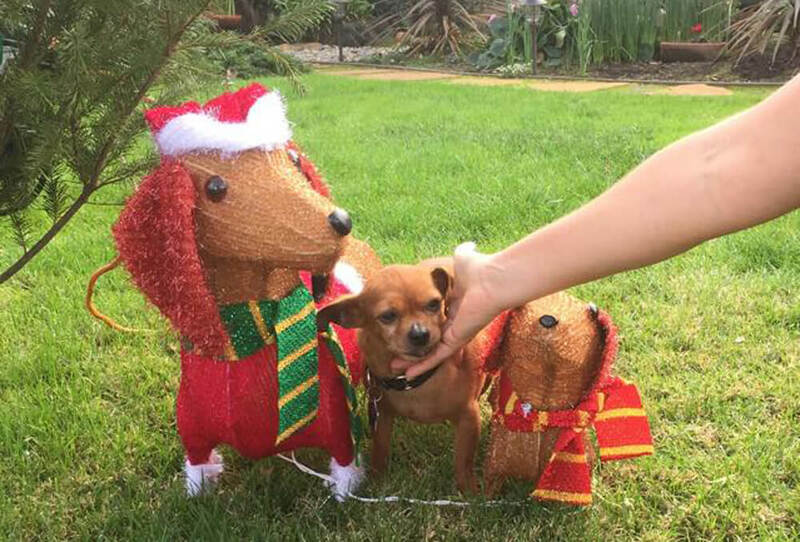 Finally, a family from San Jose expressed genuine interest in adopting Merrill and Taco. 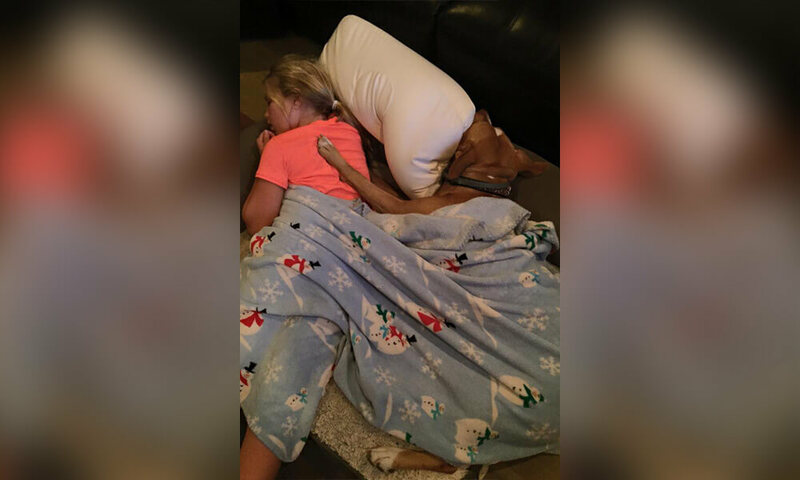 The family may have come across the post on accident, but for the dogs it was a complete miracle. The family drove to Jodi’s house to meet Merrill and Taco, falling even more in love upon laying eyes on them. But Merrill and Taco’s journey didn’t end there. Taco was already in his old age by the time he and Merrill had been adopted. It was only when they moved into their new home that Taco’s health issues began arising. 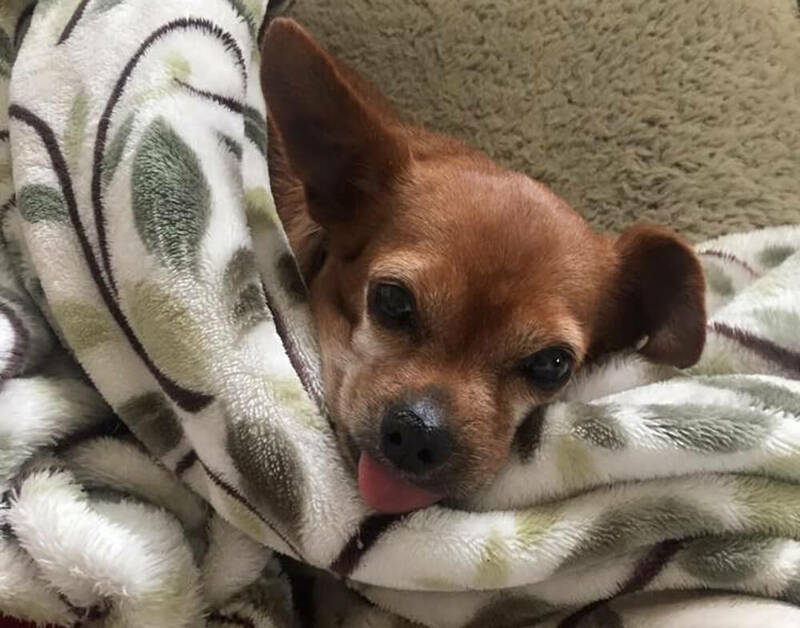 Taco was afflicted with both a dental disease and asthma, which caused him to have only four teeth and an adorable floppy tongue that always sticks out. It was clear that Taco and Merrill’s previous owners didn’t care for them as they should’ve. After a few months, Taco’s new family finally took him to the veterinarian to get a full assessment of his ailments. Taco was actually suffering from heart failure. His heart was enlarged and there was fluid surrounding his lungs, which made it harder to breathe when combined with his asthma. It was then that the family feared the worst for Taco, who they hoped would stay with them for at least a year. Taco’s fate was not looking great, especially with his failing heart. 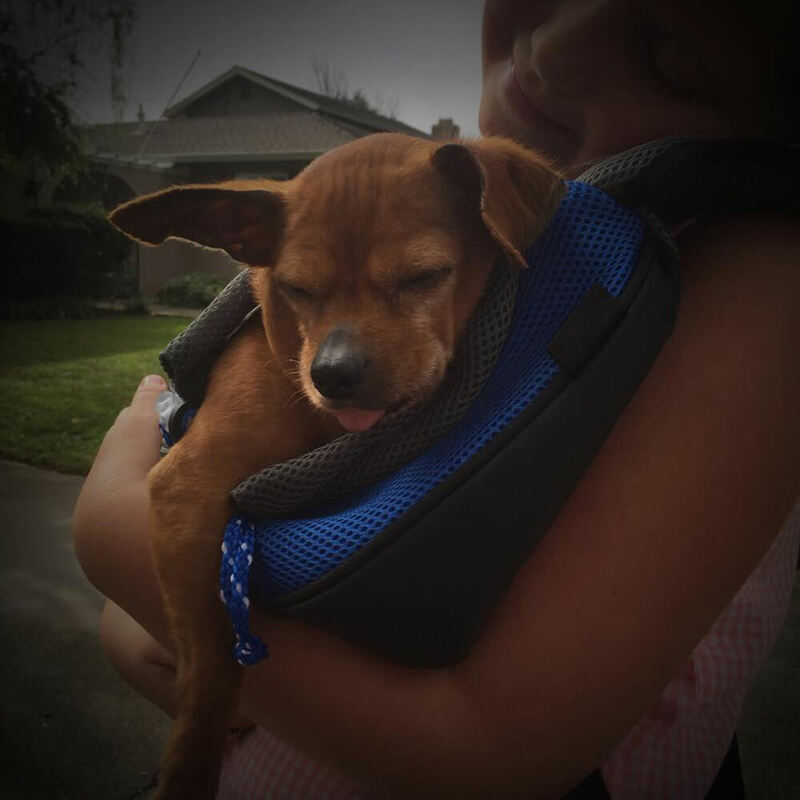 The veterinarians made Taco’s heart problems a top priority, explaining that something needed to be done before it was too late. 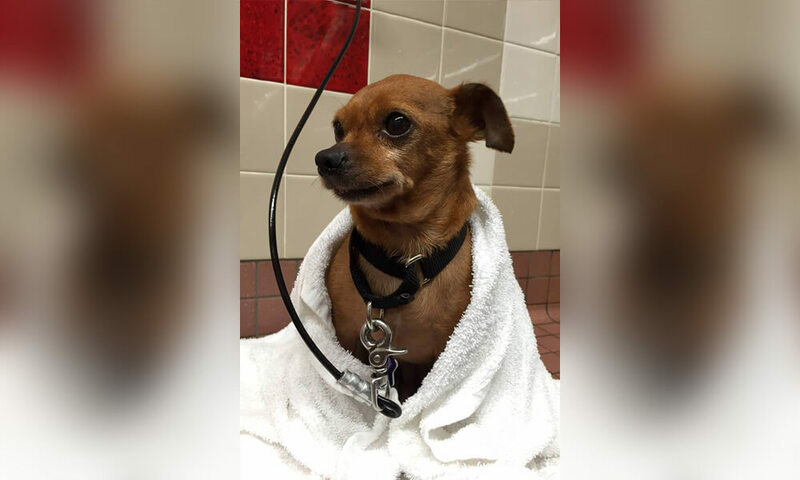 While they waited for a specialist who could help him, Taco was put on special medication. The family waited anxiously for Taco to be seen, but tried to remain positive for the sake of Taco and Merrill. After all, dogs can sense when something is wrong. Taco’s chances of survival were pretty low considering his old age, but still, his new family didn’t give up on him. They had all the faith in the world that he would make it through, showering him with more love and attention than he ever received in his life. But what really helped Taco through these trying times was having Merrill by his side. After all, they’ve been on this journey together since the beginning. Thankfully, Taco’s treatment was working and he started feeling better. 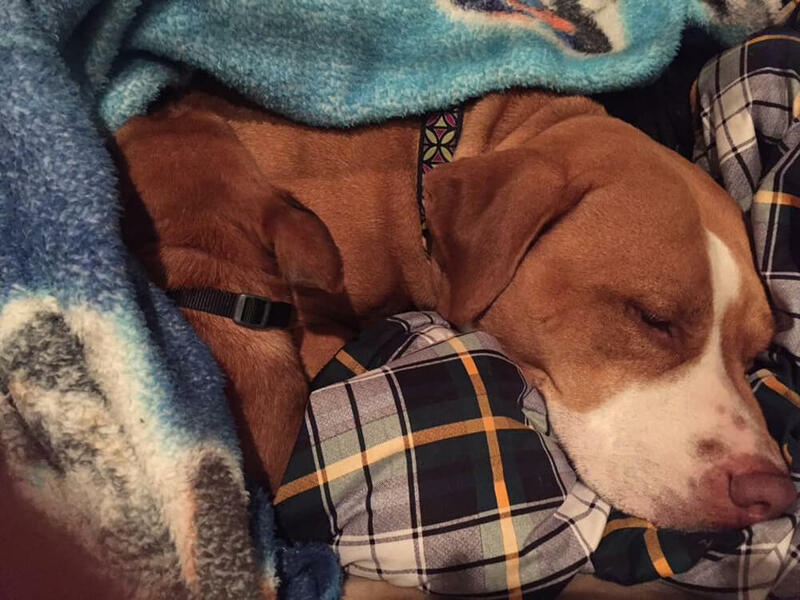 His heart began to stabilize and he was able to start living the normal life of a dog. 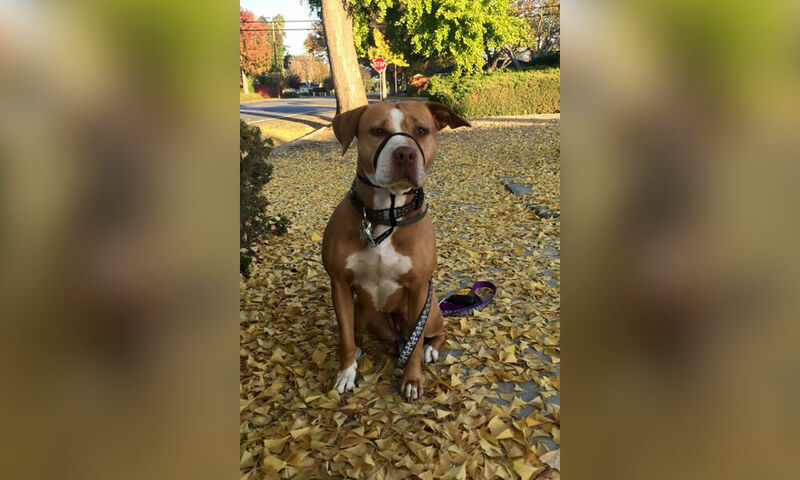 Taco’s treatment included anti-seizure medication and steroids because of the fluid around his lungs. While his heart was on its way to healing, he would also be subjected to medication for the rest of his life. Still, Taco was given a miraculous second chance to live his life with Merrill and his new family. Their health issues aside, Merrill and Taco began living their best lives. 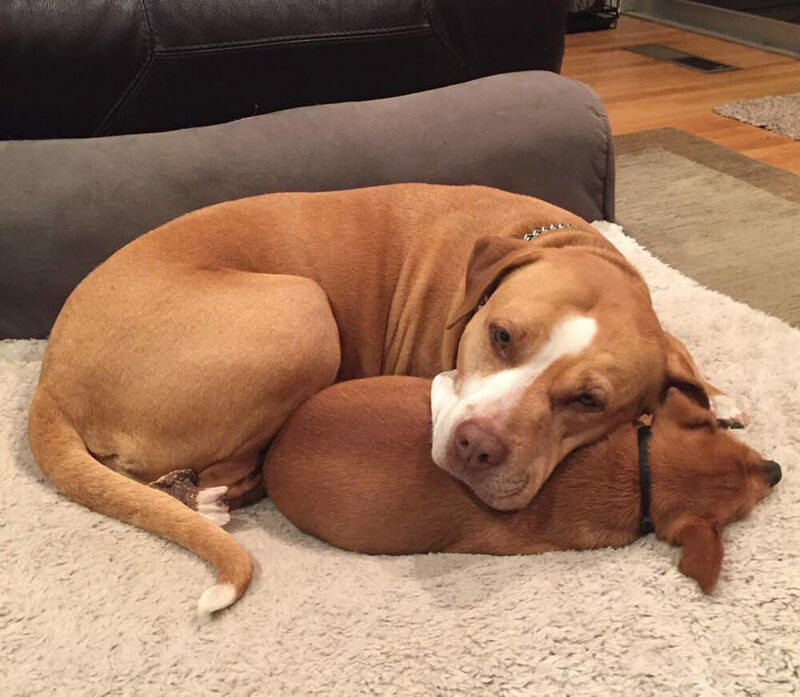 It took about a month for them to find a forever home, but that month felt like ages, especially since the dogs wouldn’t be separated. For Taco’s part, he is able to keep up with his best pal Merrill despite his size and his age. Both Merrill and Taco are incredibly loved by their new forever family, who made a Facebook page for the dogs. Merrill and Taco were still pretty Internet famous by the time they were adopted, but their new family still wanted their privacy. Even though the family wanted to remain anonymous, they understood people’s admiration for the dog duo. 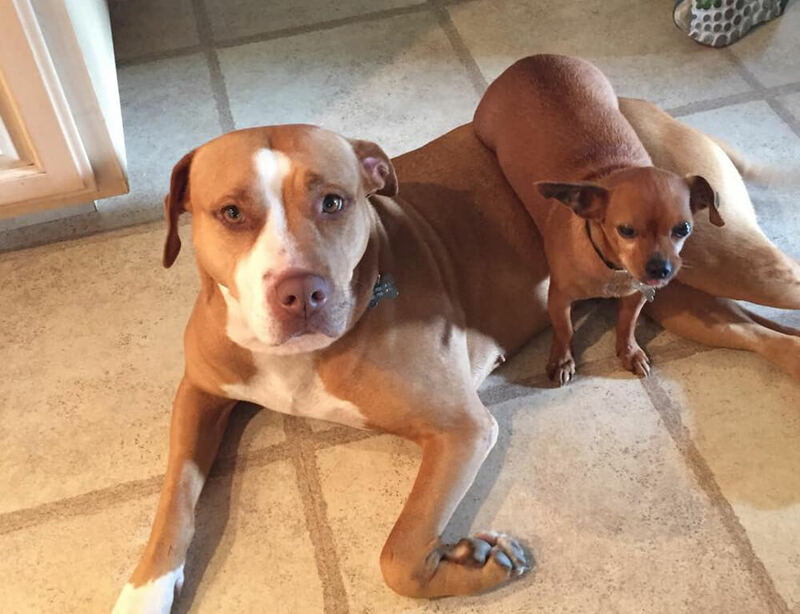 They created the “Merrill & Taco” page to update all the dogs’ fans on their new lives in their new home. People were pleased to see that Merrill and Taco’s bond was still as strong as ever. Even though Merrill and Taco could finally spend the rest of their lives together with humans who genuinely loved them, they still cried when they were separated! This only showed how strong their bond actually was. Though Taco couldn’t always run around with Merrill, he loved being held and watching with his humans while Merrill roamed free in her new home. Their new lives were unlike anything they’ve experienced before. But it wouldn’t last forever. 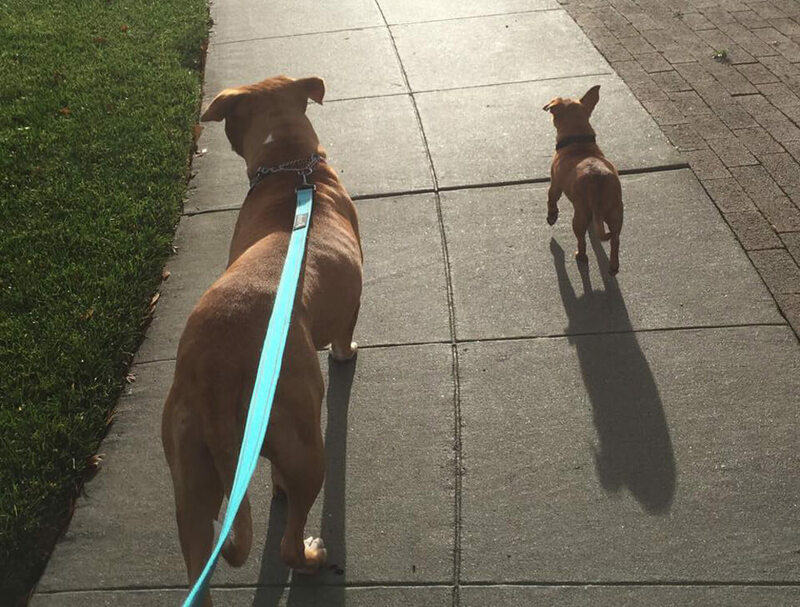 Taco’s new family helped him discover a new favorite pastime. For one, he loved being carried around like a baby! Whenever he’s not playing with Merrill, he will snuggle up with his new humans, who sometimes swaddle him up in their own t-shirts! Surprisingly, Merrill is still sensitive to her pal Taco. Despite the fact that she’s a stronger dog breed, she never displays dominance over Taco. She often lets him climb all over her! Despite his small size, you wouldn’t believe how Taco treats Merrill sometimes! When they’re not cuddling with each other, Merrill and Taco love snuggling with their new humans. Another favorite pastime for the dogs is sleeping, often with one of their humans by their side. It’s clear that their new humans love them during all hours of the day. 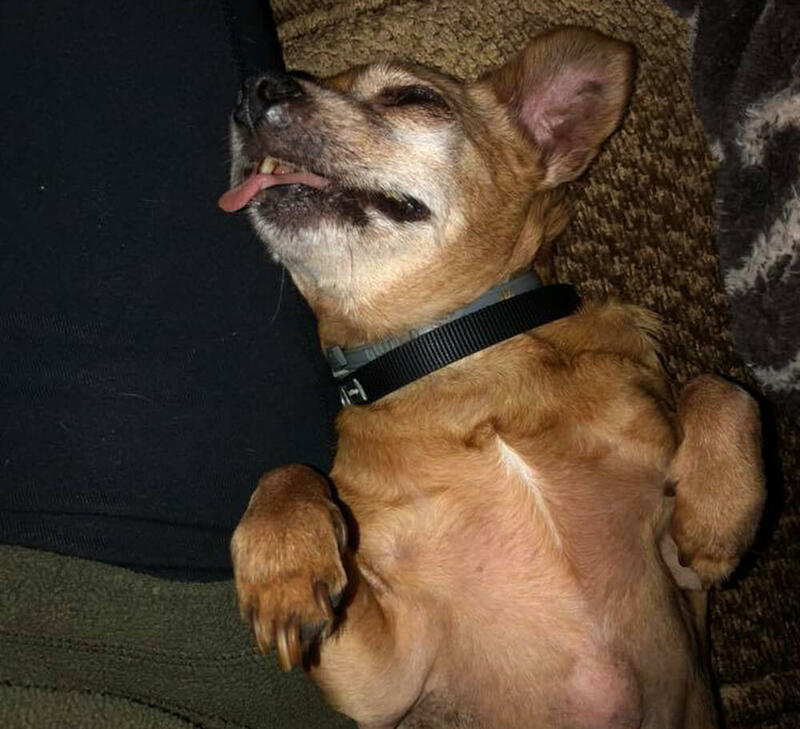 Merrill and Taco’s new owners often catch one of their kids and one of the dogs in some of the most hilarious sleeping positions, that you’d wonder how they’re sleeping peacefully! After getting adopted, Merrill and Taco have come so far from their lives at the shelter. They were even further from their mysterious lives before the shelter, which many assumed was not healthy. But it was all behind them and Merrill and Taco probably can’t even remember what it felt like to be abandoned shelter dogs. With their new lives came new family traditions. This photo is from Christmas with their new family, which they’ve probably never celebrated before. But the biggest celebration for Merrill, Taco, and their new family was the one-year anniversary of their adoption. 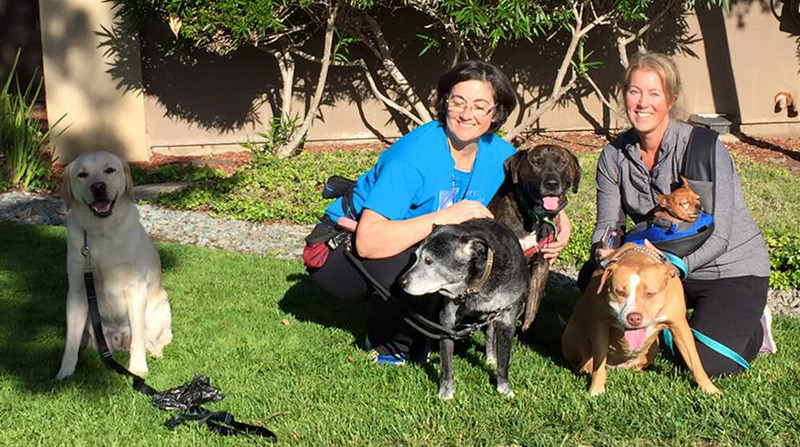 To celebrate, the family took Merrill and Taco on a grand walk with some of their best canine pals. 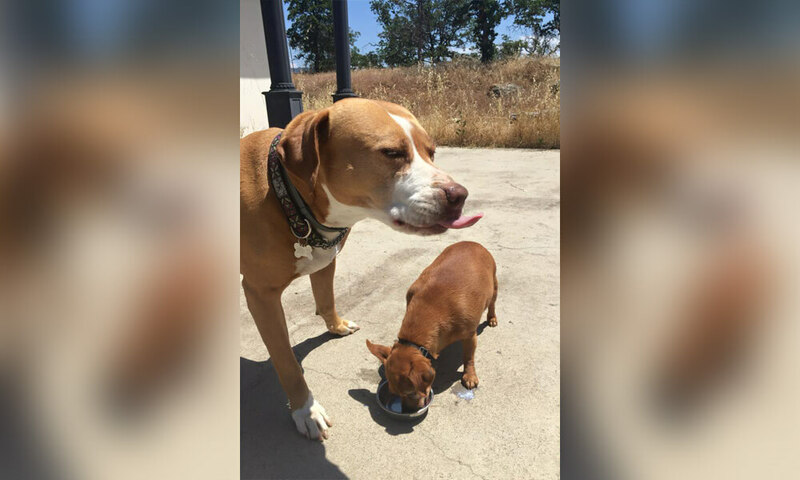 The dogs’ owner shared a photo of Merrill and Taco with their friends and a woman named Kim, in the blue shirt. Kim was actually the woman who shared the now-famous photo from Taco and Merrill’s joint post. 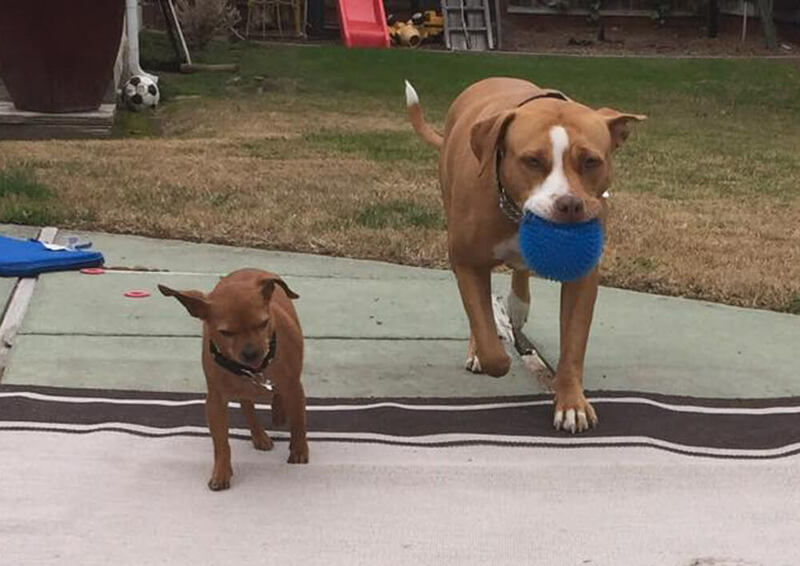 What makes Merrill and Taco such a lovable dog duo is the unbreakable bond that they share despite their unusual size difference. 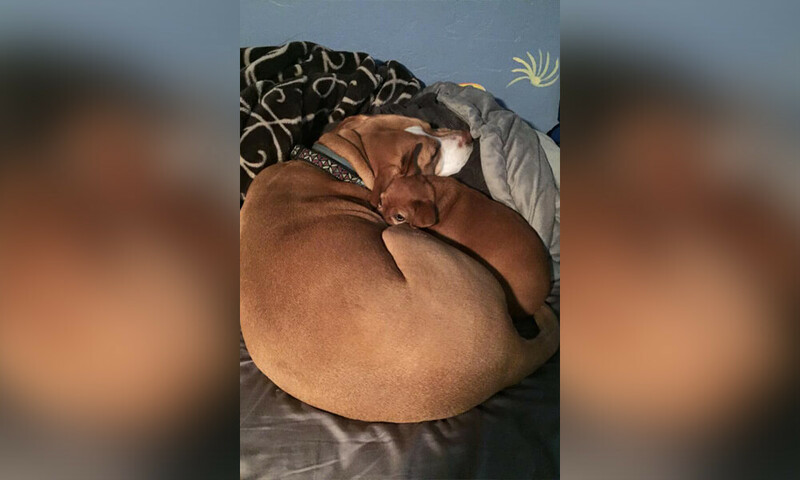 They are two very different dog breeds, but that doesn’t seem to bother either one of them. Taco is always snuggling and climbing on Merrill as if she were the same size as him, and vice versa. Merrill and Taco must have gone through a lot together, which is most likely why they love each other so much. Merrill and Taco have a relationship that left an impression on many, especially the folks who worked at Rocket Dog Rescue. 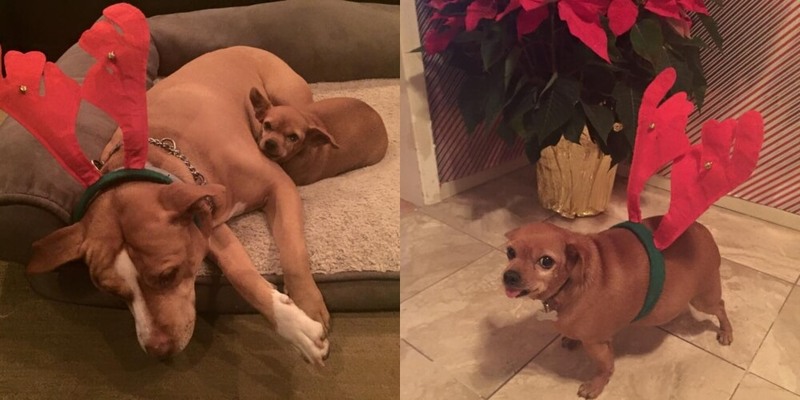 Long after Merrill and Taco were adopted, Rocket Dog Rescue still shared photos of the pups, to show their happy ending. They once shared a photo and wrote, “Merrill & Taco are doing wonderfully in their forever home. They are enjoying hanging out by the fire snuggling up after a long, fun filled day. Remember that Merrill was still relatively young at the time of her adoption. Since then, she has grown into a sociable dog who has made plenty of new canine friends. 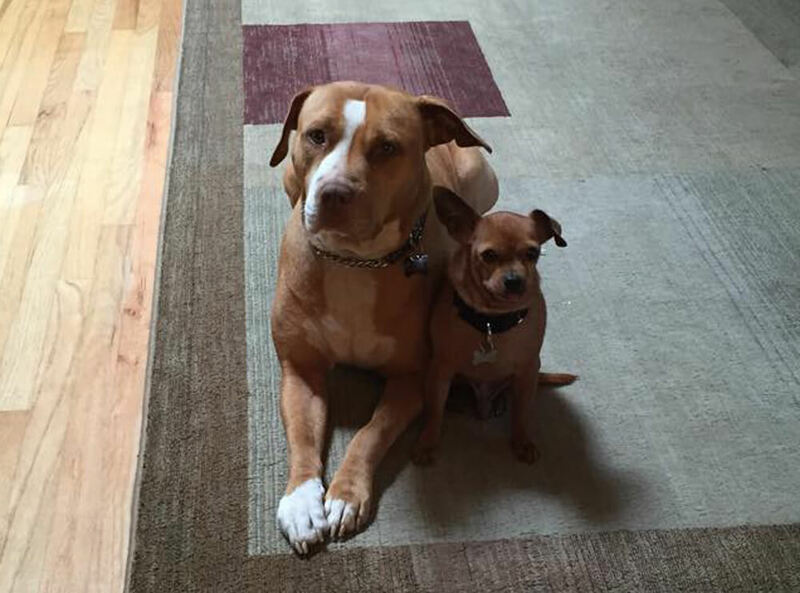 Her new owners shared this picture of her with her new pal PJ on their first play date. Though Merrill looked overjoyed to be running around in the sun, people couldn’t help but notice Taco’s absence. As it turned out, he had other ideas of fun. Merrill and Taco’s trust was strong, and they soon grew comfortable in their new digs and were finally able to start spending time apart. Their new owners explained that when Merrill goes out to play with her new friends, Taco prefers to stay home. This is probably due to his older age. Taco is perfectly content to relax at home with his humans, who explained Merrill’s high energy play dates wouldn’t be safe for him. Merrill and Taco were very fortunate to get adopted by humans who know how to treat them right. On one occasions they were even treated to a doggy spa day of sorts! This would seem amazing for humans, but the dogs apparently didn’t take to the bathing part so well. It’s clear that Taco and Merrill can now be classified as pampered pooches. As a result of that, they are often subject to some dog-friendly manicures and pedicures as well! 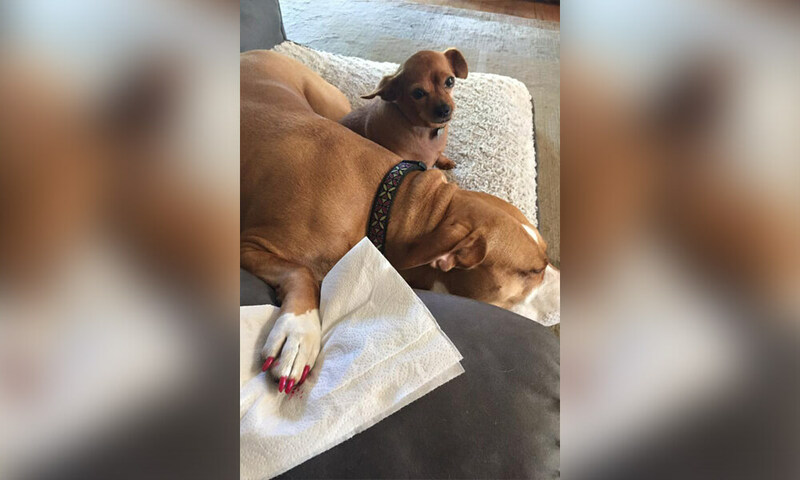 Their owners even purchased a dog-safe nail polish called Pawlish, made by famed nail polish brand OPI. Merrill was treated to this delightful pink color and thankfully she snoozed right after as they dried. It would have been a pink disaster if she started running! 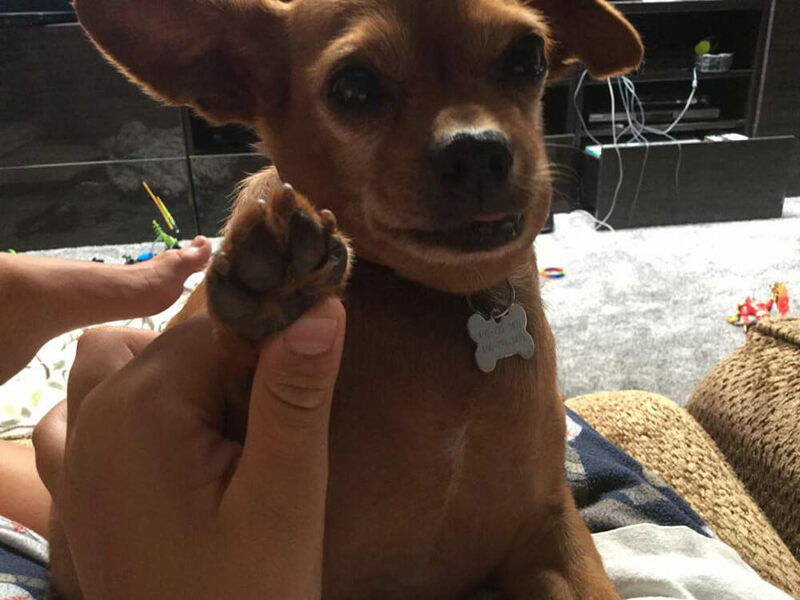 Taco may be a small pup, but he has a bark and bite that are far bigger than he is. 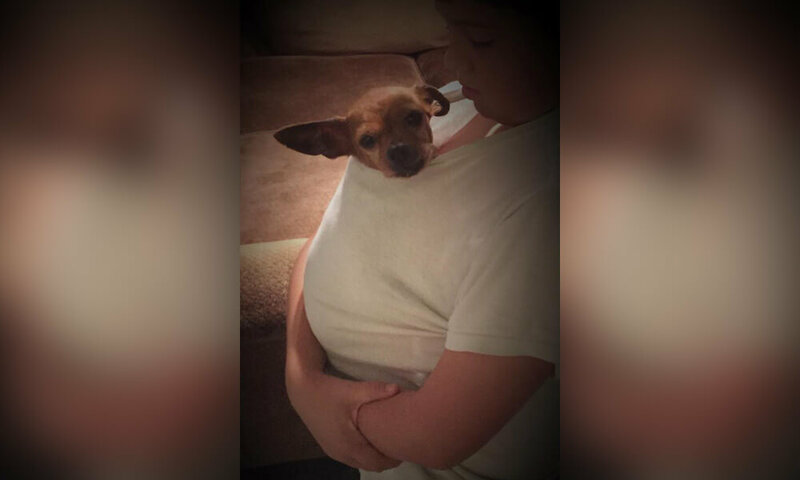 His owners recounted the hilarious story behind this photo. 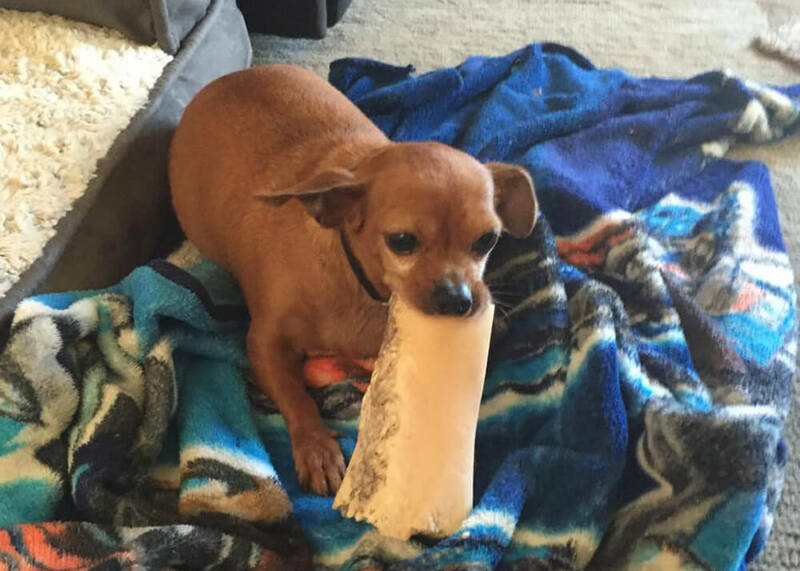 “Merrill got a nice big yummy bone… We heard Taco barking from the other room and went to investigate. He was barking at Merrill telling her to back off from his bone. He’s not going to let a severe deficit of teeth slow him down,” they wrote on Facebook. 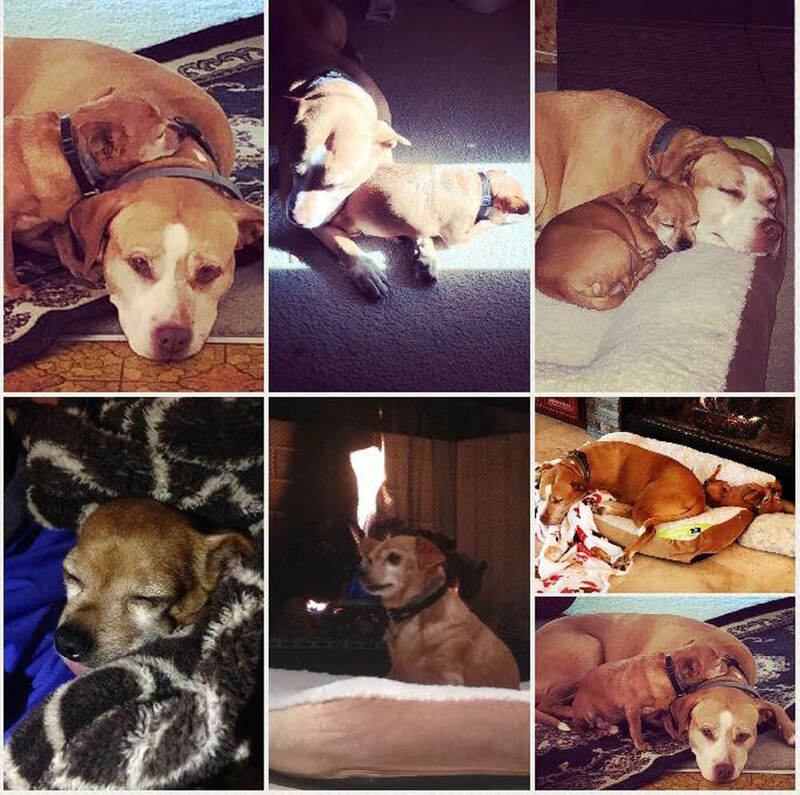 It was a miracle to see both dogs have survived long enough to make it to two Christmases with their new family. Merrill got festive when she was dressed up in a reindeer antler headband. Taco tried to join in on the fun, but the sizing was off. Merrill and Taco’s health are of the utmost priority for their new owners. They understand that these poor dogs have been through a lot, and much of it was probably undeserved. Because they want Merrill and Taco to live their best possible lives, they often have to got to the vet. 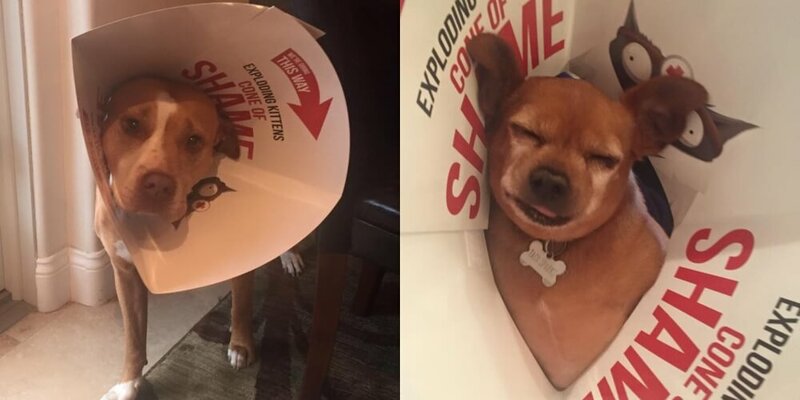 In 2017, they rung in the new year by taking Merrill and Taco for some more procedures, both returning home in the infamous cone of shame. One of the benefits of their new lives is the opportunity to explore new parts of nature with their new family. 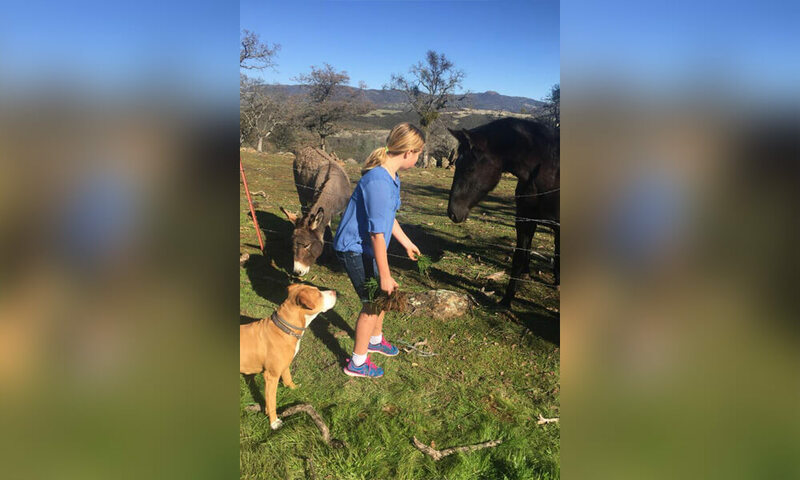 Here is a picture of Merrill meeting both a horse and a donkey for the first time, while Taco was safe at home. Their owners wrote on Facebook, “Merrill is very interested in this big creature.” We can only assume that they’re referring to the horse and not Merrill’s human sister! 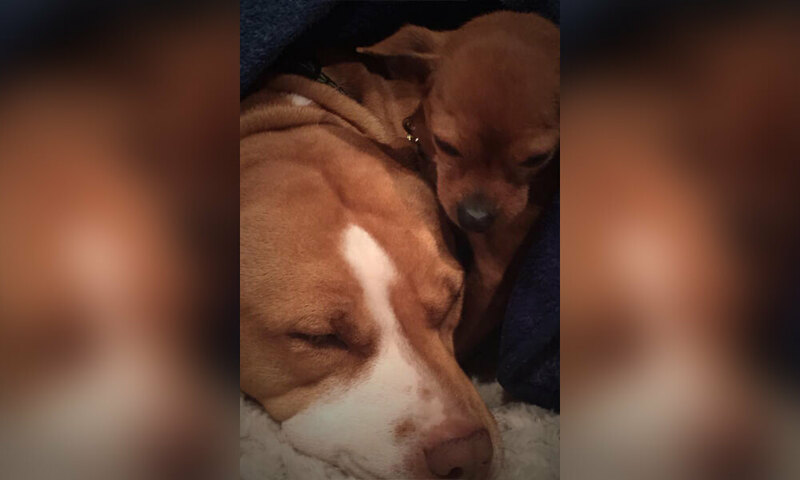 There’s no sweeter wake up call than one from this adorable doggy duo! 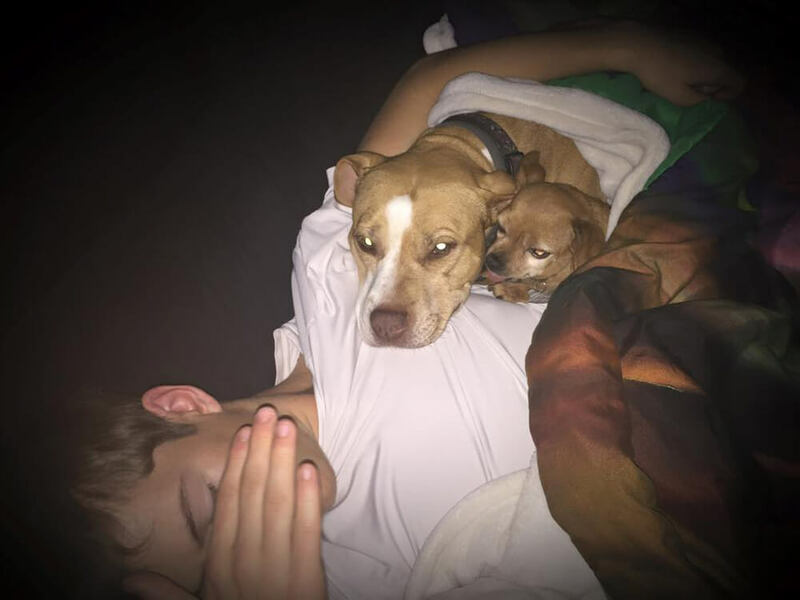 Merrill and Taco helped their owners wake up their human brother by snuggling right up under the covers. When that didn’t work, they snuggled right under his arms. Obviously, this sort of wake up call is more comforting and probably wouldn’t inspire many to get out of bed, which is probably why the boy’s parents took a flashlight to his face. Thanks, Mom and Dad. Life isn’t always easy for a dog. Merrill and Taco are two pups who know that all too well. Thankfully, they’ve always had each other to get through the hard times. Sometimes, all they need is a good snooze snuggled right next to each other. They often share the same bed! 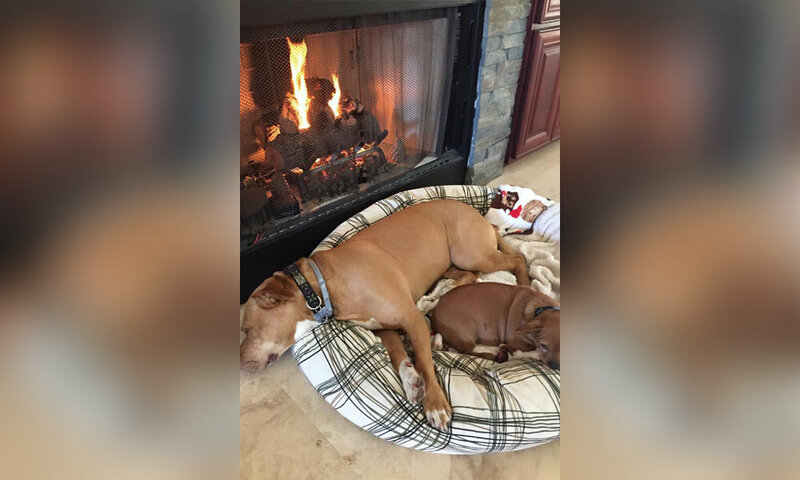 Their humans shared this incredibly adorable photo of the duo asleep with the caption, “Home sweet home.” It pretty much speaks for itself! Taco’s passing was hard on everyone, especially Merrill, who will forever feel this loss.